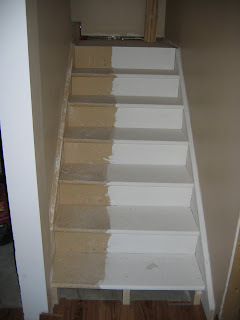 Cottage on the Edge - the DIY Cottage Blog: A Stair Painting Tip: a Halftime Painting Trick! A Stair Painting Tip: a Halftime Painting Trick! How do you paint stairs when you have to use them? The trick is to do it in two steps. I will be eventually painting the stairs with a textured paint to give a 'stone' look but they first have to primed. I don't intend to do the finish painting until the spring arrives -- when we can avoid the stairs by walking outside to go up and down between the two floors of the cottage. But I did wish to get the priming done ASAP to make the stairs cleaner and easier to keep clean. Priming them seemed to be the answer! Except there is a big obstacle.... There is at least two feet of snow on the walkway from the basement door back up to the front door. Not really an option! The answer is to paint one half at a time. Last weekend I painted one half. This left the other half free for travel up and down. Next time we are up I'll pain the other half and we'll use the first painted half to travel up and down. Voila! problem solved and a cleaner looking stair to boot!